With motorbike thefts up as much as 44% since 2014, it remains a sad fact that if not properly secured or alarmed, they are far are easier to steal than cars or vans. The recovery rate for motorbikes is also far lower, with around 25% to 30% percent of motorcycles successfully recovered in the UK. If you have woken up in the morning to find your bike has disappeared from your drive, or that your garage or shed has been broken into, here is our step by step guide to what to do once your discover that your bike has gone missing. If the bike theft is in process, call 999. If however you’ve gone to your bike and realised it has gone, call 101. This will be your initial instinct anyway, and you’ll probably expect a visit from the Flying Squad within moments of your call. The sad fact is, however, that due to the sheer number of thefts reported every day in the UK, the theft of your bike will not be a priority for your local police force. They will, however, take your details, ask you questions about your bike and where it was kept, and most importantly give you a crime reference number which you will need when you report your loss to the insurance company. This crime reference number is vital as it’ll be the central point of reference for you and the police in the days and weeks following your bike going missing. When you call 101, keep your V5 Registration Document to hand to enable you to give accurate details about your registration number, your chassis and engine numbers. All of these will be useful to the police if they do track down your bike, or it appears later on as part of an ongoing investigation. If your bike has gone then the chances are it HAS been stolen however sometimes vehicles in London are moved by councils, due to roadworks or other activity. If this is the case, the council will have a record of it. Check out the TRACE website and see if your bike has been lifted by the council. BikersUnited is a National Stolen Motorcycle Register. Post your bike details here and they automatically get posted to social media channels and alerts local bikers to keep an eye out. It takes just a few minutes to register your bike. Your bike’s registration number and details can then be easily found by anyone searching in Google. So if a bike looks suspicious, a passerby might Google the details and find your listing, alerting you to your bike’s whereabouts. Sad as it may sound, there is every possibility that your bike has been nicked by kids who simply wanted to have a little “fun” with it before dumping it somewhere nearby. This is a growing phenomenon and you cannot rule out the fact that your beloved bike could be lying in a nearby park or kerbside ditch, looking a bit out of sorts, but mostly still in good order. If you fall victim to a more sophisticated group of criminals, they will often steal a bike, then move it to a location (often within a mile) where they will leave it to see if it gets any attention. The thieves want to have a better idea that you don’t have a tracker fitted. In London, they often move it to an on-street bike parking bay somewhere nearby, put a cover on it and a couple of locks and hope you won’t find it. Get a mate to help you and spend a few hours checking out the local industrial estates, as well as behind shops and buildings. From where the bike was stolen, take a look around for CCTV. If you can find cameras, approach the shops or buildings where the cameras are located and see if you can get hold of any footage. Often the criminals will turn up on another motorcycle or scooter when they come to pinch yours and getting the details of this – whether it’s a number plate or make and model or description of the people who stole your bike – will be further evidence to add to your case and increase the chances of your getting your bike back. Once you are sure that your bike hasn’t been hidden in plain sight, give your insurance company a call. Make sure you have your insurance documents to hand and that you have given them a good once over before you make the call. This way, you will have a better idea of what assistance you are entitled as part of your policy. At this point, your insurance company should be able to talk you through the process, as well as reassure you that they are on hand to help. Having your bike stolen can result in a plethora of emotions, from anger at the indignity of it all, through to concern about how you will be able to get around without your bike. Your insurer should be able to reassure you and provide a structured plan of action for you. You might not want to claim on your insurance. If you have a really strong No Claims Bonus and your bike was worth under £2,000, it might not be ‘worth’ you claiming on your insurance, as after any excess is discounted, the loss of your NCB and the time it takes to claim, it might not work in your favour. It’s worth remembering, if you report the bike stolen with the police, your insurance company won’t have access to that system, so you can keep it from them. It is vital to report it stolen to the police as it gives them accurate figures of actual crime in the area and helps them fight for the required resources. The year it was registered. The location it was stolen from. The time it was stolen, or the last time you saw it. You will also need the crime number that the police gave you when you called them. Your claim will take time to process, as most insurers would prefer to see the bike recovered than to pay out for the cost of it. They will usually allocate 30 days to wait and see if your bike is found and returned to you. Your insurer will be able to help you sort out the repairs for your bike. They usually offer a selection of preferred repairers who will arrange to repair your bike for you. Depending on the nature and exact cover of your policy, the cost of any repairs deemed necessary as a result of the theft will usually be covered by the insurer. Be careful though, and make sure that you know exactly what they will be paying for before sending it away to get fixed up. Well, in that case, the insurance company will make you an offer to compensate you for the loss of your vehicle and to help enable you to purchase another. What you think your bike is worth vs the amount they are prepared to offer you, can vary dramatically. If you owe finance on the Bike, you will obviously need to use these settlement monies to clear your finance. If you have bought your motorcycle on finance, this is where GAP insurance comes into play, as it will limit your losses. Check out our GAP insurance guide here. You never know who witnessed the theft of your bike. If you print out some leaflets and put them up around the area your bike was stolen from you might get some interest. Generally speaking, people don’t know that a bike is being stolen, they might just think a couple of lads and working on their bike. However people have routines; local dog walkers, people going to work, delivery men – they might be in the same place at the same time each day and may have a vital clue. Secondly, if your bike was stolen from a motorcycle bay, other bikers will definitely appreciate a leaflet on their bike to let them know they were close to being targeted. You never know – one of those bike owners might have seen or fended-off some suspicious activity recently and they might be able to add some valuable evidence to your case. Once you have listed your bike on BikersUnited, you have a person URL that you can share on social media. The trouble with posting your bike just on social media, is that social media is often a ‘walled garden’, i.e. some groups are closed to the public and therefore the information has a limited audience. Also it’s often hard to trace the initial poster meaning sometimes you can’t be contacted. Having your bike on BikersUnited means you have a link you control and can remove as and when you want. It could stay there for years and you never know, your bike might turn up. We’ve seen examples in the cycling world where a bike has turned up in another country years later. If your bike has been stolen, you might think Step 7 is a case of shutting the stable door after the horse has bolted. However you might get your bike back and if you do, you don’t want it being pinched again. In some cases, you might feel there was literally nothing you could do to prevent your bike being stolen. 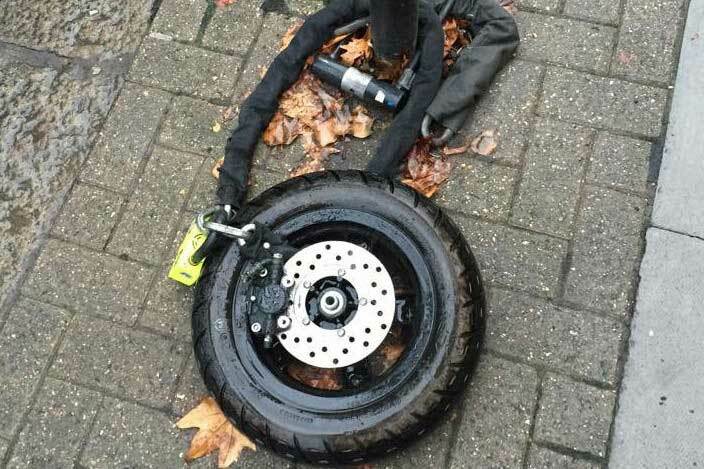 We’ve seen lots of cases where thieves have cut through 2 heavy-duty chains, and two disc locks – if your bike is stolen with this sort of security on it, you were targeted by career criminals. However, security is about layers and making the scrotes have to work through as many as possible. Five good locks on your bike are no use if three blokes can still lift it into a van in 30 seconds. Some modern-day thieves use sophisticated means to steal to order. But, if your bike is being scoped-out by a chancer looking for his next grab, you can help to ensure that the odds are stacked in your favour. Always use a cover. They cost around £20 and are a great way to keep your bike out of sight. If you can, keep your bike in a locked garage or shed. For additional security, you could invest in a ground anchor which you can use to lock your bike to. If you don’t have access to a locked building but you do have a regular parking spot – in your front garden for example, consider fitting a ground anchor to ensure your bike is locked to a solid object and less prone to being lifted. Invest in a professionally fitted alarm system to deter thieves and to reduce your insurance payments. Use a motorbike lock as a visible deterrent. Mark parts of your motorcycle with your VIN (vehicle identification number). That way if it does get broken down for parts, they can be identified. Finally, use your common sense. If an area is known for high rates of thefts, or looks unsafe, park your bike in a well-lit area that has good visibility. Keep your bike well protected and it should never leave your side. But if the worst does happen, use all avenues available to you to find it or have it replaced.